MacArthur Park has what you could call a split personality. On one hand, the heavily used urban park in the dense central L.A. neighborhood of Westlake is a godsend in a notoriously park-poor part of Los Angeles. On any given day, you can find dozens families with their children, scratch soccer games, public concerts and an impressive array of street food to satisfy virtually any taste. Of course, when you go to sit down and munch on whatever delicacy you purchased from the woman with a cart, say some chicharrones de harina, you&apos;ve got to do a double take and make sure you don&apos;t sit down on a used syringe, or someone taking a nap. 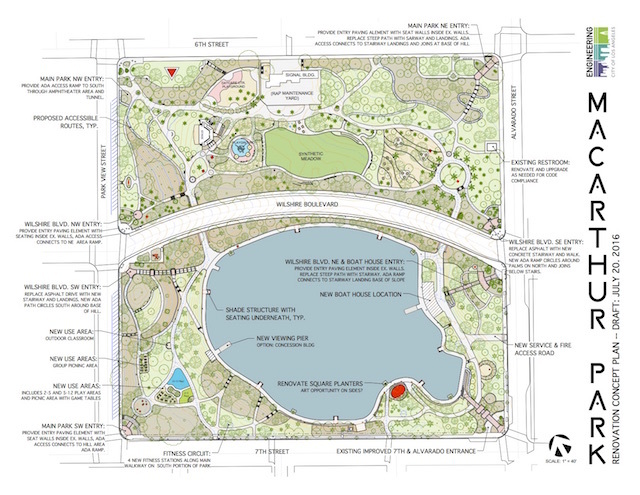 Combing through the rendering, we learn several things about the city&apos;s long term plans for MacArthur Park. High on the list of notable changes include the construction of a new boathouse on the lake, a new viewing pier into the lake&apos;s middle, a new shade structure on the lake&apos;s edge, new picnic areas with outdoor tables, an outdoor classroom, a new fitness circuit with exercise machines and rebuilt restrooms. The plan also pays special attention to several of the park&apos;s steep and wheelchair un-friendly walkways. Aside from building several new, ADA compliant walkways, many of the park&apos;s entrances will be rebuilt with wheelchair accessibility in mind. It&apos;s important to note that the above rendering is a work in progress. Though the estimated cost of the above renovations is $20 million, only a portion of that funding has been secured so far. Fredy Ceja, communications director for Cedillo&apos;s office, explained to LAist how money for the ADA accessibility improvements and a new lake-water filtration system has been secured. Other improvements, like the new boathouse, are currently unfunded. Ceja noted, however, that Cedillo&apos;s office is proactively looking for funding sources for the other proposed improvements. The plan itself is the result of several community meetings held in Westlake, intended to determine what specific renovations are most important to the people living in MacArthur Park&apos;s immediate vicinity. 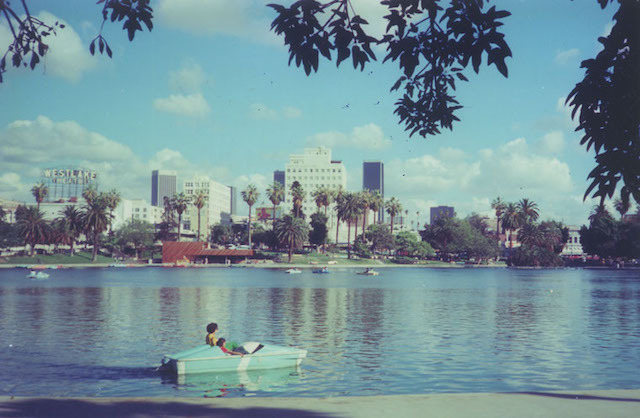 As for the new boathouse, it comes with the understanding that boats would also be returned to MacArthur Park lake once construction finishes. 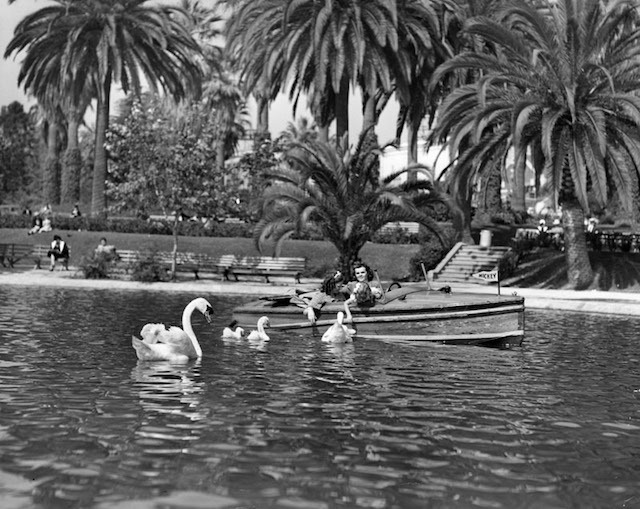 Though boats haven&apos;t sailed on the lake anytime recently, they have been a common feature of the park throughout its long history. Coincidentally, plans for the park&apos;s renovation come as downtown L.A.&apos;s building boom begins to edge west, spurring concerns of gentrification in Westlake. In late August, a developer filed plans for a 41 story tower, 478-unit apartment building at Wilshire and Bonnie Brae Street, just a couple blocks from the park. Several other low-rise developments are also under construction in the area, with more planned.